Forgive my repetition, but for summary’s sake: Soul Eater revolves around a bunch of kids, classified as anthropomorphic tools of destruction (weapons) or those that wield them (meisters), whose end goal by training at the Death Weapon Meister Academy (DWMA) is to keep the world safe from witches as well as those that feast on human souls for the sheer guilty pleasure of it. Centered on students, the main theme is, appropriately, one of learning. 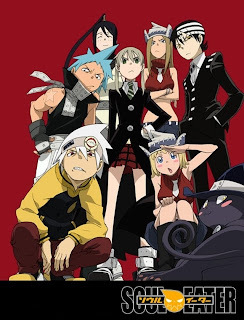 Edification does not have to mean mindsets or skill sets or interpersonal relationships, but Soul Eater manages rather impressively to interweave all three in a manner that never becomes formulaic or boring. If there was one defining factor that initially caught my eye and made me keep tuning in to FUNimation’s streaming broadcast, it was a combination of the art and fight choreography. But within the first few episodes, I also found myself chuckling at the series’ sense of self-deprecation and drooling over the engrossing nature of the interaction between all of the characters. In short, for a Naruto-esque anime, there’s a lot of good writing lurking in the subtext and an abundance of surrealist art bolstering the background that lend to an amazing series. Not to say that the screenplay is Kafka nor the art Dali, but the series doesn’t attempt to hide its obvious craft. Instead, it adopts elements and uses them to suit its own various needs. The art, while a bit CGI-heavy, offers viewers surrealistic backdrops and personifications (gotta love the sun and moon) as well as fight scenes that are as interestingly executed as they are engrossing. There is a minimum of hazed-out background transformations and executions during fight sequences, making the animation and depiction of fights solely reliant upon actual action (go figure). This adds to both the realism of certain situations and the sheer pleasure of watching things actually happen. Details, it’s all about the details ... until things get moving. Over the run of the first 13 episodes, the first three of which are entirely action-driven, character-building prologue, the frequency of detailed action scenes slips, but this is taken up by the upswing in character maturation and mind games between friends and enemies alike. This is not a weak point though. The action remains in focus while more and more characters are introduced and simultaneously woven into the fray. In fact, one of the most interesting and sinister characters, whose actions result in one of the most entrancing battles within the fantasy genre I’ve yet to see, only really gets her debut in episode 12! Ah, which audio track to tune into? (I could write an essay purely on that!) While I think the Japanese is absolutely and without question perfect, I’d also admit that the dub grew on me like a weed. Don’t get me wrong; the English dub is well-acted in almost every respect (if only seeming phoned-in and out-of-sync a bit too many times), but whoever cast a woman to voice Black Star is at fault for the series' sole inexcusable audio atrocity. While her enthusiasm shows through and through, Brittany Karbowski should NOT be voicing one of the most vivacious central characters in the show, an early teen male, simply because of her estrogen levels and vocal range. Everyone else, however, finds their role and convincingly plays their parts, but there’s just something grinding about Brittany’s girlishness, which, to her credit, is either tamed or brainwashed via repetition throughout each subsequent episode. This review is based on a DVD box set provided by FUNimation Entertainment.